Choose from the pinch bottom Expand-a-Mailers in white or our NEW versatile and flexible Kraft StayFlats Fit mailers The StayFlats Fit mailers can be used flat or expand up to 2". 10 x 7-3/4 x 1"
12-1/2 x 9-1/2 x 1" Side gusset expandable mailer. 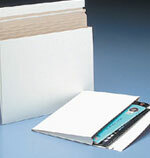 Expand-A-Mailer made from plain white lightweight .020-point recycled board. 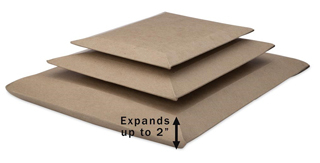 12-1/2 x 9-1/2 x 1"
15 x 12-1/2 x 1" Expandable Fiberboard mailing envelopes . 15 x 12-1/2 x 1"
17 x 14 x 1"
We can custom print StayFlats mailers with a simple return address or custom print on up to 100% of the mailer front and back. Our extensive printing capabilities allow you to fully use your imagination to make just the right presentation. Becomes a 5x7" inside useable space when full 1.25" capacity is used. 7 x 9" Expandable Kraft mailer. Becomes a 5 x 7" inside useable space when full 1.25" capacity is used. Versatile mailer can be used flat or expanded. Becomes a 6x8" inside useable space when full 2" capacity is used. Becomes a 6 x 8" inside useable space when full 2" capacity is used. Becomes a 9.75x12.25" inside useable space when full 2" capacity is used.